In the Mayan language, Xel-Há means “where the water is born,” and that is still the case today. This Experiencias Xcaret park is the place to go for lovers of all things underwater. The park's convenient location in Riviera Maya makes it an ideal spot to visit during a trip to Mexico. Xel-Há is often considered a natural aquarium and a paradise for those who love to explore the local flora and fauna while on vacation. The crystal-clear water in the area makes it a perfect place for snorkeling. After gearing up with a snorkel, life jacket and fins, visitors can head to the water to see what awaits underneath the surface. The area is home to more than 90 marine species including surgeonfish, parrotfish, grouper, a few barracudas and much more. Guests of the park are allowed unlimited snorkeling and even get a snorkel as a gift to take back home. Inner tubes are also available to those who want more of a relaxing experience and breaks from being totally submerged in the water. Guests can relax while slowly floating down the river and jump in for a snorkel session as they please. 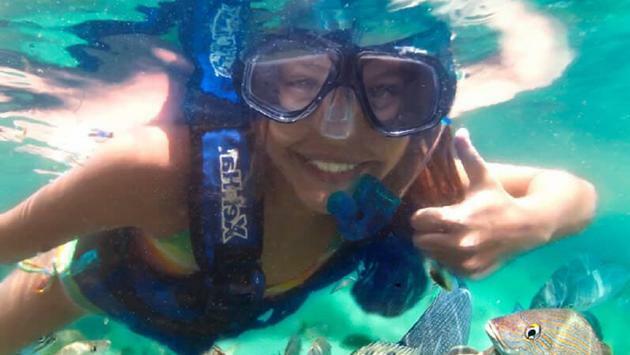 If snorkeling is on the radar for your next trip to Mexico, Xel-Há is the park you’ll want to explore. Learn more about Xel-Há on Experiencias Xcaret’s website.